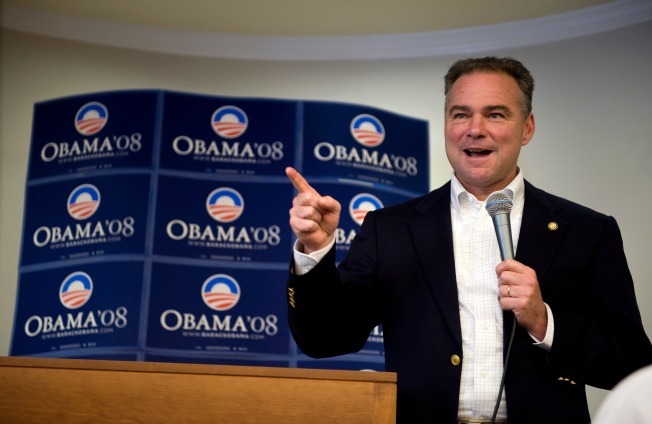 Tim Kaine spent President Barack Obama's first year in office pulling double duty as Virginia's governor and the Democratic National Committee chairman -- and weathering criticism that he was an ineffective, absent party leader. Over the past month, Kaine has increased his visibility, fundraising and travel to rally support for the president's agenda -- specifically Obama's endangered health care overhaul plan and economic fixes -- and minimize expected Democratic defeats in what's shaping up to be a difficult election environment. seeks to right the ship. Democrats say White House advisers realized they needed help spreading their message and wanted Kaine to be a more visible surrogate because they trust him to stay on script and deliver the president's viewpoints with the right tone. accepting money from political action committees or lobbyists -- compared with $81 million for its Republican counterpart. He raised an additional $9.2 million in January and has been to nine states since his term ended Jan. 16. He's increased his TV appearances on from roughly one a week last year to an average of four a week this year, including eight in the past week alone. Vermont governor, was the chief attack dog while leading the party when it was out of power. Kaine sees his job as primarily supporting the White House. focused equally on changing policy as it is on electing Democrats. In Kaine's first year, Democrats complained that he was missing from the national stage and hadn't done his part as chairman. They grumbled about Obama's decision to house his campaign network -- Organizing for America -- at the party, saying it was creating confusion in states. They griped that the national party seemed far more focused on Obama's 2012 likely re-election race than it was on ensuring Democrats retain majorities in Congress and among the roster of governors in 2010.
in his leadership.'' He pointed to Kaine's electoral record. Democrats have won five special congressional elections and a re-count in the 2008 Minnesota Senate race on Kaine's watch. But they've also lost a Massachusetts Senate race, and governors races in New Jersey and Kaine's home state of Virginia. Chris Redfern, Ohio's party chairman, said he hopes Kaine's boosted role means Democrats will be answering Republican charges more aggressively.